Use the blocks on the left. The first variables and code section. Making the calculation part to your program. Making the Victor tune section to the program. 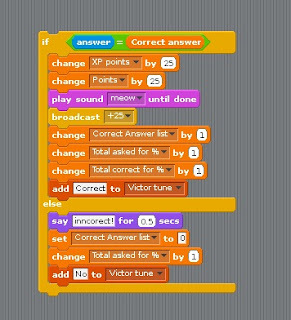 Coding is easy with Scratch you can download it here. Chose the correct package for your operating system and follow the instructions. Do not worry, this is easy and does not take too much time to do. Once you have downloaded it, open the app and then you can begin to program. Once open it should look like this. 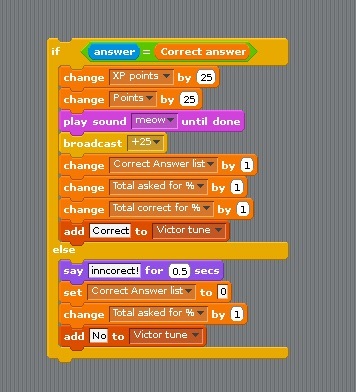 Coding is easy just use the blocks on the left to write your program. The code blocks are divided up into groups. Select the code block group you want and drag the block onto the stage. The blocks will snap together once they are close enough and some will even fit inside others. how it works. Notice the different shapes. Making the first variables could not be easier. 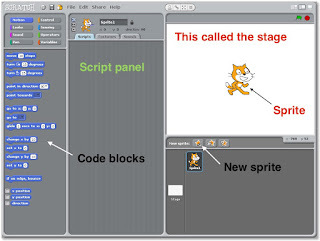 Click on the cat sprite in the panel below the stage then go to the variables section of the code block groupings and click on make new variable then select ‘For this sprite only’ and name it ‘Points'. 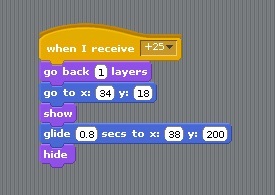 Your new variable should appear in the code block panel on the left now drag the ‘set block’ onto the scripting panel. The next variables are slightly different. 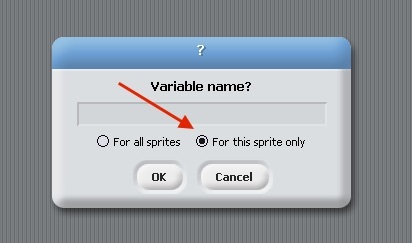 Make a new variable, but this time select ‘For all sprites’ and call it ‘Percentage’. It is important that you get the above correct or your program will not run correctly. Chasing bugs can be a pain in the neck! To restate, the first variable is local (For this sprite only) and call it ‘Points’. The next variable is global (For all sprites) and call it ‘Percentage’. For the first three code blocks use the ‘show variable’ block (XP points, Points and Percentage). The rest need to be the ’Set to’ block; in addition, you need to add one more ‘set to’ block for percentage. This will insure that the correct variables are shown and/or set to zero. Go ahead and snap all the blocks together. The variables allow you to store data in that you can later call on. The list does the same thing the exception is that is hold data in a list called list items. The percentage blocks will be called on when the code needs to work out the percentage of your score. The correct answer list variable will be used to store number of correct answers. 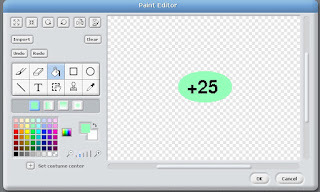 The points variable will be used to display points achieved in this section of the game. Later you will add ‘when i receive’ hat block to the top of this code block. It is easy to make a new sprite. 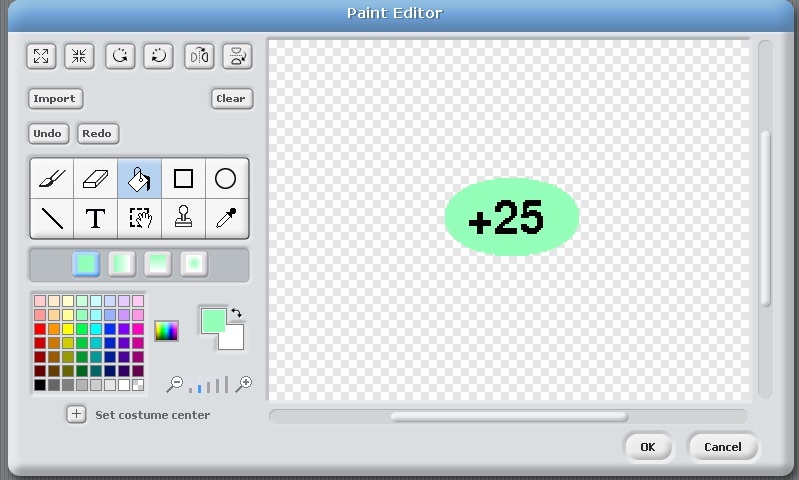 Click on the ‘paint new sprite’ (the image at the top of the blog will show you were it is) and this window should appear. You will need to add the adding and pink box. 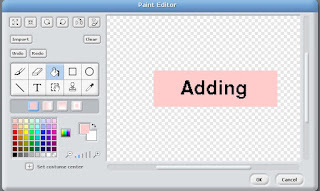 You can do this by clicking on the text button indicated by the T. Click on the square button next to the paint bucket to add and resize the rectangle. Use the paint bucket to add colour. When you are satisfied, click OK at the bottom and the new sprite will appear in the sprite panel next to the cat. Insuring that the ‘Adding’ sprite you just made is selected, from the control section of the code block groups drag in the ‘hat block when Sprite is clicked’, the ’show’ block from the looks section and ‘broadcast and wait’ and place them in that order. Save your code. You should have this. select the ‘Costumes’ tab and select edit. 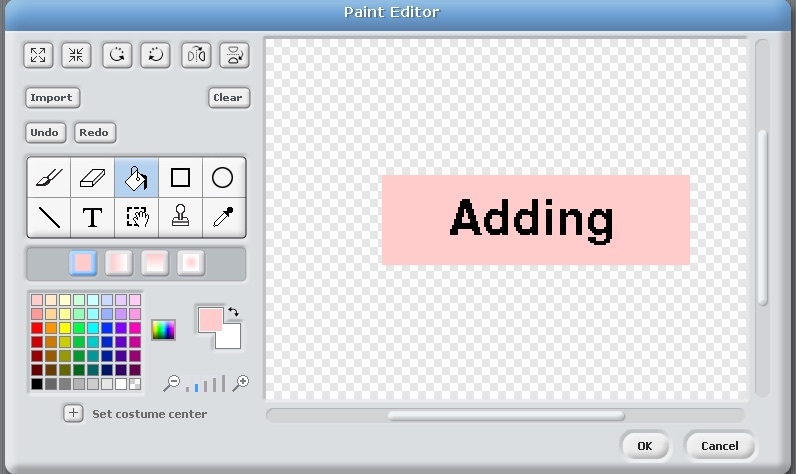 Rename the sprite ‘Adding’ by clicking in the grey box and typing it in. Notice that the Hat block changes to ‘when Adding clicked’. The ‘show’ block will make the sprite show on the stage move the sprite to just above the bottom left. Change the broadcast single to ‘Hide all others' by clicking on the black arrow and selecting new then type ‘Adding’ into the box that appears. Change the broadcast single block at bottom to ‘Adding’ by using the same steps. It is a good idea to experiment with the paint sprite editor; however, you will need to end up with something like this. Remember to use the ’Show’ block by dragging it into the scripting panel and clicking on it to make the new sprite appear. Position the sprite partly over the cats head. The code for the +25 sprite is as follows: check that you have the +25 sprite selected and drag in the ‘go to back’ code block from the ‘looks’ section of the code block groups. Check the block indicates going back one layer. Now drag in the hat block ‘when i receive +25’ in and place it on top of the ‘go back’ block. Now drag in the ‘go to’ block from the ‘motion’ section and place it under the ‘go back 1 layers’ block. This will position the sprite in the same place every time; it takes it coordinates from the position of the sprite that you place it in at the start that is why you have to position the sprite beforehand. Next, drag in the ’Show block from the ‘looks’ section and place it under the ‘go to’ block. Additionally, drag in the ‘glide 1 secs to x y’ block, set the time to 0.8, the x: to 38 and the y: to 200. 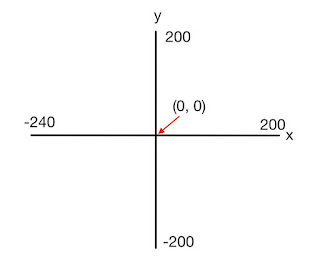 The stage has different coordinates all over it with x:0 and y:0 at the centre. 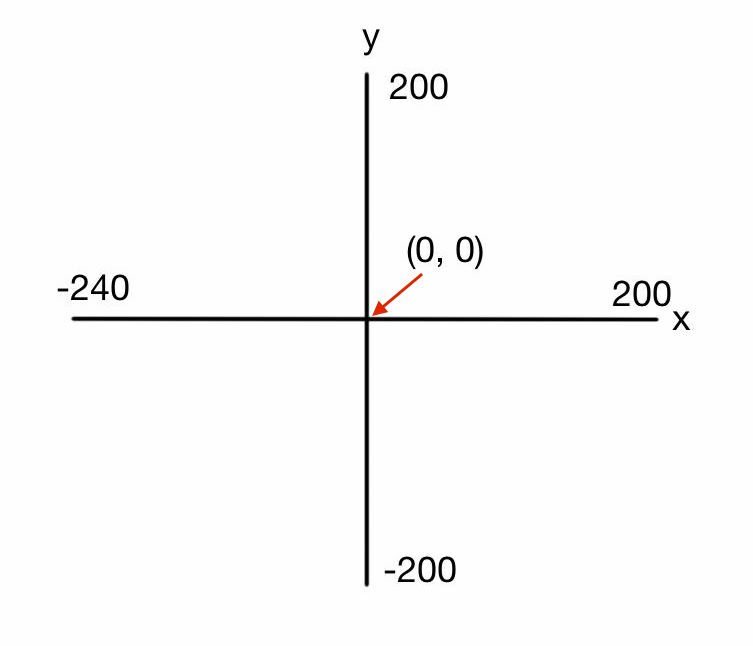 (0, 0) is called the point of origin. This code will make the +25 sprite appear and then glide to the top of the stage in 0.8 secs then hide it. Double click on the hat block to see if it works. If you have not already done so, click on the cat sprite to make the code appear. From the control section drag in the hat block ‘when i receive’ and place it above the orange block you made earlier. From the hat block select ‘Adding’ from the drop down menu by clicking on the black arrow. Make a copy of the block of code by right clicking on it and selecting duplicate then place the copy to one side, but keep it in the script panel. The good news is that you can make copies from this to use later on. Although it is easy to make the calculation part to the program, it does require you to concentrate a bit. 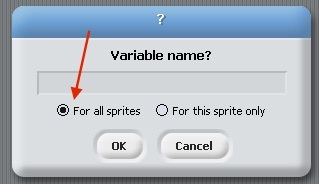 First, make two new local variables (For this sprite only) and call them ‘a’ and ‘b’ and one global variable (For all sprites). Name it ‘correct answers’. Second, drag in the ‘if else’ block from the control section of the code block groups you will use this to form a Boolean statement (if some condition is met, run this block of code else run the other block of code). With Boolean statements, the condition set is either true or false. Now, to set the condition for the drag in the ‘equals’ operator from the ‘operators’ section and place it inside the ‘if else’ block (you will see the whole it fits into next to the ‘if’ part). From the ‘Sensing section’ drag in the ‘answer’ block (it looks different from the others) and place it into the first part of the equals operator then drag in the ‘correct answer’ variable and place it into the other part of the equals operator. In addition, you will now need to add the code for the ‘if’ part of the Boolean statement. To start drag in two ‘change’ blocks from the variable section. Click on the black arrow and select ‘XP points’ then set the ‘by’ to 25. The second block you dragged in should be set to ‘change Points by 25’ and placed under the first variable in the ‘if’ part of the ‘if else’ block. Go to the sound section of code block panel and drag in the ‘Play sound meow until done’. Place this block under the two orange blocks. Next, drag in ‘broadcast’ block from the control section and set it to +25. Following this, drag in three ‘Change’ blocks from the variable section and set them as follows: Change correct answer list by 1, Change Total asked for % by 1, Change Total correct for %. Now, place all three under the ‘play sound meow until done’ block. 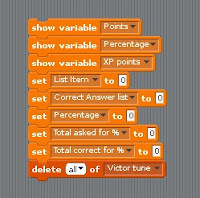 Finally, drag in from the variable section the ‘add thing to Victor tune’ and change ‘thing’ to ‘correct’ by clicking on it and typing it in. Now place this block under the three orange blocks. For the else part, drag in ‘Say hello for 1 secs’ and replace ‘hello’ with ‘Incorrect’ then change the 1 to 0.5. secs placing it in the else part. Next, drag in a ‘set to’ block from the variables section and change it to ’Set correct answer list to 0’ then place it under the ‘Say Incorrect’ block. Drag in a change block and set it to ‘Change Total asked for % by 1’. Drag in an ‘add thing to Victor tune’ and set it to ‘add No to Victor tune’. Finally, make a duplicate for the entire ‘if else’ block and place it to one side. Save your code. Your block of code should look like this. The green part sets the condition of the Boolean statement, so if the condition is met the block of code in the ‘if’ part runs. 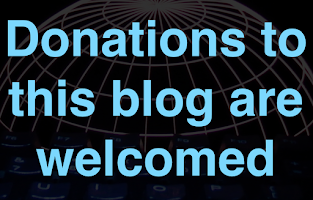 Subsequently, If the condition is not met, the block of code in the ‘else’ part runs. You will see why the ‘else’ part sets ‘Correct Answers list to 0’ later. The idea is to get five correct answers in a row. This is the second block of code you will use a lot, so don’t forget to make a copy. Although this part of the code is not essential for the smooth running if the programme, it provides you and your child the opportunity to play with the code. First, drag in a 'repeat' block from the control section and set it to 2. 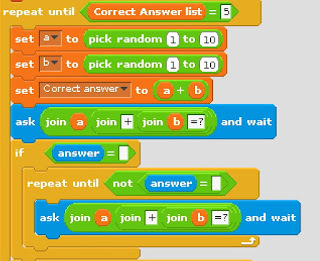 Drag in a ‘change’ block and name it ‘Total correct answers (5)’ the code will be need this later on in the program when you make badges. Now place it above the repeat 2 block. Second, drag in a ‘repeat until’ block from the same section. After placing the ‘repeat until’ block into the ‘repeat 2’, set the condition by dragging in an inequality block (>) from the operator section. Now drag in the ‘list item’ variable and place it into the first part of the inequality block. Now drag in the ‘Length of Victor’ block from the variable section. Third, drag in an ‘if else’ block from the control section and set the condition as follows: Drag in the ‘equal operator’ block and place it in the gap next to the ‘if’ part of the ‘if else’ block. Now drag in ‘item of Victor’ and place the variable ‘list item' inside it. Now place this inside the equal operator and set it to correct. It should now read, 'repeat until list item > length of Victor tune. The ‘if’ part. Drag in ‘Play drum for 0.2 beats’ block and place it in the ‘if’ part. From the operator section drag in ‘Pick random’ block and place it inside the drum block between play drum and for and set it to ‘Pick random 35 to 81’. This will pick a random number between 35 and 81 and then play that note. Next, drag in a change block and set it to ‘Change list item by 1’ now place it under the drum block. The ‘else’ part. Drag in a 'Play note' block and place it into the ‘else’ part then drag in the ‘Pick random’ and place it inside the note block. Set the ‘Pick random’ to ’48 to 72’. Now drag in a ‘Change’ block and set it to ‘Change list item by 1’ and place it under the ‘Play note’ block. Directly under the ‘repeat until’ block, place a ‘set item list to 1’. Finally, drag in ‘Play sound meow until done’ block directly under the block of code, so it is the last block and place the hat block ‘when i receive Victor tune’ and place it above the repeat 2 block. Save your code. Your code should look like this. When victor tune is broadcast, this block of code will run. It checks if the list item in the list = correct or something else then it plays a drumbeat or note based on this data. The rest 2 block instructs the code to run twice. The repeat until block instructs the code to go through the list until it reaches the end. You do not need to make a copy of this code section. To calculate the percentage of your score you will need to divide the total correct answers (y) by the total tries (x) then multiply this by 100. First, drag in two ‘set to’ blocks and two ‘change’ blocks. Change both ‘Set to’ blocks to percentage. Form the operator section drag in a ‘multiply operator’ and then drag in a ‘divide operator’ placing it in the left side of the ‘multiply operator’ then type in 100 into the right hand side. Next, drag in the ‘Total correct for %’ variable and place it into the left of the divide operator. Furthermore, drag in the ‘Total asked for%’ variable and place it into the right hand side of the divide operator. 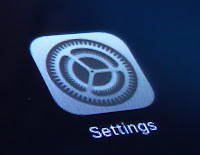 Drag the ‘round’ operator block and place it into the second percentage variable then drag in the percentage variable and place it into the round operator. Place the two variables together. Next, set the first ‘change’ variable to XP points by 100 and the ‘points’ variable by 100 now you can place them both under the set to variables. Finally, drag in the ‘broadcast and wait’ block and place it under the other blocks. Make a duplicate and place it to one side. Save your code. Your code should look like this. The ‘Round’ operator block will round the value in the percentage variable to the nearest integer. The change blocks add a 100 bonus point to your score. First, drag in a 'repeat until' block and set it to ‘repeat until correct = 5’. Second, drag in three ‘set to blocks’ and set them as follows: ‘Set “a” to pick random number 1 to 10’, ‘Set “b” to pick random number 1 to 10’ and ‘Set correct answer to a + b’. Now place all three blocks together and inside the repeat until block. Third, drag in the ask block from the sensing code block section then drag in three ‘Join blocks’ from the operator section and place them inside one another. Place the ‘a’ and ‘b’ variables in the join operator with a + and +?’, so it reads ‘join a join + Join b = ?’ and place it inside the blue ‘ask’ block. Copy the blue block with the green blocks inside. Place one of the ‘ask’ blocks directly under the three orange blocks. Finally, drag in an ‘if’ block and set it to ‘if “answer” = ‘ and drag a repeat block in placing it in the ‘if’ part. Now set it to ‘repeat until “not“ ‘”answer’” = ‘and place the other ask block into the ‘repeat until’ block. Save your code. Your code should look like this. Please note that the answer = has an empty space in it. It is important that you don not enter anything in to it not even a space. The purpose of this is so if nothing is entered and return is pressed accidentally, the same question will appear. Questions will continue to be asked until you have entered in five correct questions in a row. Now that you have all the sections of code, you will need to put them all together. The repeat until Correct Answer list = 5 part goes under the first block of code you wrote. Notice that the second block of code you wrote goes in repeat until Correct Answer list = 5 and directly under the last if block you wrote. The percentage block goes at the bottom. Save your code. Remember, you will also have the copied sections of code in your script panel please leave them there for now. Your finished code should look like this. Test out your code if you have any problem, compare your code to the image above. Your start the program by clicking once on the Adding sprite in on the stage then you enter you answer. Your program should run like this. I have purposely answered two questions incorrectly to see if the program is run correctly. I have also left some of the variables showing to see if the correct values are deposited in them. Your challenge is to improve the tune at the end using the sound blocks. See if you can make a short tune or sound then substitute it in for the sound blocks already in the program. Next blog i will show you how to add in subtraction and multiplication into your program. Since you have much of the code already, you will not have to do much work.